can you run it, run it? it’s that time of year, ladies and gentlemen. race time! with spring upon us, the city of atlanta comes alive as a running town, folks taking the park, sidewalks, and beltline wherever their feet may carry them. 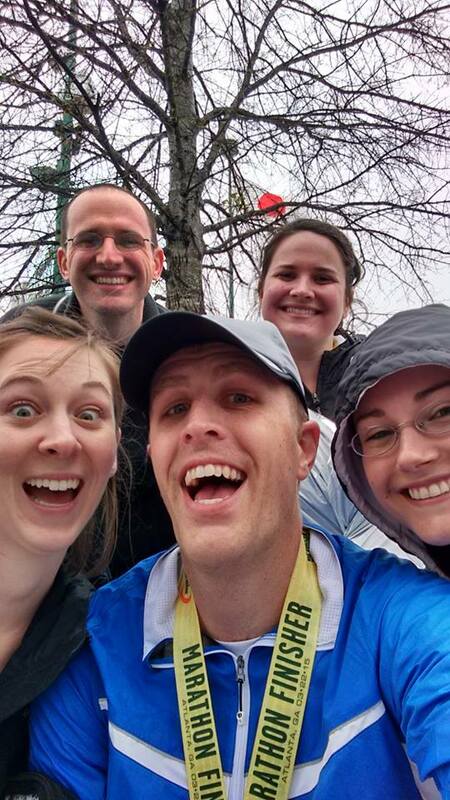 well, this year a few of us joined in on the organized fun by running the publix half marathon and full marathon. let me tell you now, nothing wakes you up like a 13.1- or 26.2-mile run early on a sunday morning, especially when it’s cooler and rainy. yep, that’ll definitely do it. 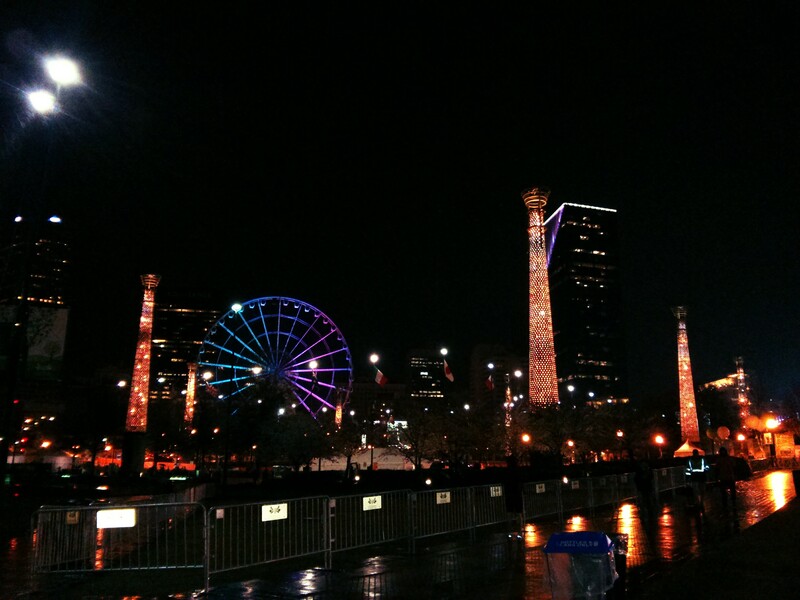 i got to centennial olympic park a touch early (i don’t think arriving at 5:45 a.m. was totally necessary, but whatever), and i wish i could say i was feeling motivated. the precipitation and temperature weren’t thrilling me, but at least the sight of the ferris wheel cheered me up a little bit. hey, whatever it takes, right? i was accompanied by bank, liz, and behrle soon enough, and before i knew it, we were dropping off our bags at gear check and heading towards the start line. i had debated greatly whether or not to take my sousa rain jacket, but that thing is all kinds of insulated, and even though it was cold at the moment, i guessed i might not need it once the running got started. behrle trotted to corral d, bank found a spot in corral i, and i just kind of joined the end of the pack. i mean, my time didn’t begin until i crossed the start line, so what was the rush? i kid you not when i say there’s absolutely no rush in beginning a multi-hour run. nope, not even a tiny bit! i had run this course back in 2013 with mild success. i hadn’t trained as well for that race, and my results suffered. i had to walk the last three miles and ended up with a final time well over the three-hour mark. although it’s still quite a feat, i wasn’t personally satisfied, so this year i was coming back with a vengeance, determined to show this course who’s boss. or is it baus? regardless, i began my race right after the seven o’clock hour and set off into the dark morning. i like to keep myself at a steady pace, so i gladly let other runners pass me left and right. my goal for this race was to run the entire thing and get done in under three hours. 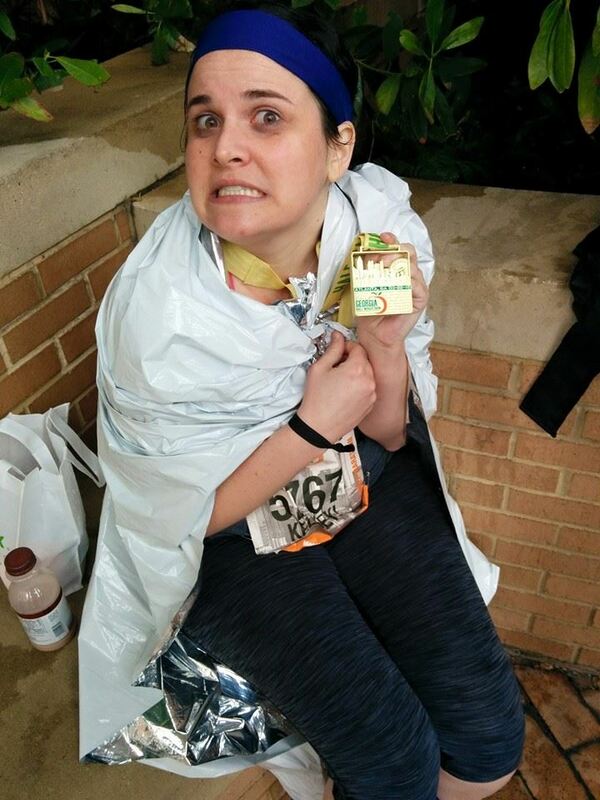 i’ve done it before at my first half marathon in athens, and i wanted to prove to this one that i could do it again. the first several miles were a bit up and down as far as the roads go, but i kept my legs moving, one foot in front of the other. i had my first burst of energy when i saw kyle, kari, and liz under their umbrellas and cheering me on at the mile five marker. there truly is nothing that can replace a personal fan base when you’re putting yourself through such a strenuous situation, and having them there made me feel like i could maybe even run the full marathon. okay, that’s not entirely true. i did feel motivated, but a full marathon is a bit of a beast, and that’s just not something i’m ready for yet. i continued through the middle of the course, fueling up on powerade, water, and jelly beans. i jogged into piedmont park and passed the nine mile marker, and that’s when the mental games began. it was at that same spot two years ago that i had to start walking, and even though i was proud i got through it this time, i knew the rest of the course was going to be a challenge. there were plenty of uphills to go, and all i could think was “man, walking would be way better than running right now.” with my goals in mind, though, i kept trudging through the course. after cutting right on 10th, we made it up to juniper for a bit of haul and then over the interstate into georgia tech’s campus. i very much appreciated the cheers from the sidelines and practically rejoiced when i made it to the pit stop with orange slices. i was very aware of how hungry i was, and that simple fact is a lot of what kept me going. at last i took a left onto marietta street and knew the end would be in sight soon. the rain was coming down at an angle, the wind whipping it right into my face. i shook off the droplets from my eyelashes and gave the last quarter of a mile everything i had. i let my longer strides carry me across the finish line and directly to the volunteers passing out the chocolate milk. it truly is the best post-race drink. after two hours and 47 minutes, i was done. it isn’t my personal best, but i did hit both of my goals, a bit impressive considering my recent travels had messed with my training schedule completely. i eventually found kyle and kari after grabbing my publix goodie bag and took a seat, grateful to be resting my legs. surely this picture looks like one of a champion, yes? as i sat munching on pretzels, i found kenneth strolling by. kenneth and i work together with bank, and it was kenneth’s first half marathon. i hadn’t found him before the race, so it was a stroke of luck that he walked right past me. he enjoyed his first half and was very happy with his results. he’s confident that he could even do a full! good for you kenneth! you go kenneth! i’ll gladly root you on from the sidelines. not long after i finished, behrle came blazing around the last corner, finishing the full marathon in just over four hours. this chick had been out at the bars the night before, got only three hours of sleep, and still managed to clock in an excellent time. i don’t know how she does it, but i do know that i love that girl. an hour or so later, we all gathered around the end of the course to find bank. 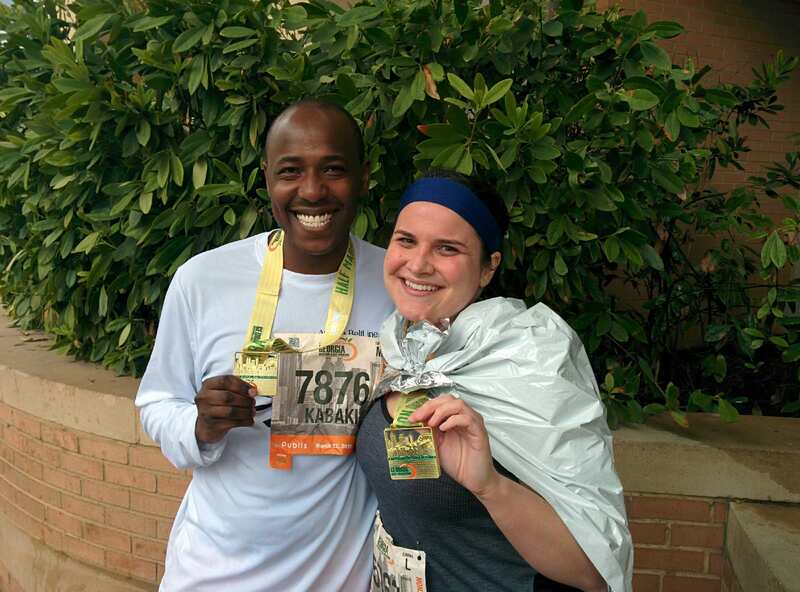 he was running his first full marathon, and after 26 miles of exhausting hills and stressful mind games, we could only imagine how ready he was to be done. kyle and i posted up at the final corner while liz and kari set up at the finish line. we squinted through the rain, looking for our bestie. soon we saw his blue jacket coming our way, and we yelled our lungs out to encourage him to finish with one last burst. he high-fived us and rounded the corner, crossing the finish line with mixed feelings. although his body was completely spent, he admitted he was very proud and amazed at himself. running for over five hours straight is no simple thing, and i applaud anyone who takes up the personal challenge to do so. liz, bank, kari, kyle, & me. when will our next race be? i’m going to bet it won’t be soon, but no matter where and no matter when, i’m sure we’ll be able to do it. there comes a point where it’s mind over matter, and if you want to really push yourself, to really find out what you are capable of accomplishing, my best advice is to do it with friends. without these faces, i’d be lost for sure. Congratulations Kelsey, you are a beast and a beautiful one at that! Aunt Cindy, you are the sweetest! Love you and miss you!